"At last-a book that marketers can use to gain real respect from CFOs and CEOs who care about the bottom line. Baggott, author of the award-winning blog 'Email Marketing Best Practices, ' clearly explains how to make your campaigns perform measurably better. The secret's in your test results." "Despite its proven power, email marketing receives a fraction of the attention given to other, fancier media. This week you'll probably hear far more about mobile videocasting (or some such fashion) than you will about email marketing. You can help correct this imbalance by reading this book." "Baggott's wonderful new direct marketing book is loaded with practical advice and recommendations from some of the best minds in the industry. Email Marketing by the Numbers should be read by everyone in the industry who wants to profit from acquiring and retaining customers." "Amidst the confusion and changing landscape of the Web, Baggott is one of the clear thinkers who can cut through the hype and help you understand how to drive revenues through the use of marketing technology." "Baggott is the ultimate Web 2.0 entrepreneur who takes Email 2.0 to a new level. 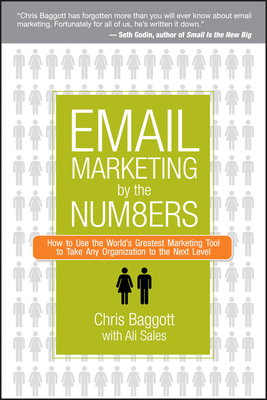 In Email Marketing by the Numbers, he gives marketers instructions for creating one-to-one conversations with prospects and customers. This book should be on the desk of every marketer in every company, big or small." CHRIS BAGGOTT is cofounder of ExactTarget, a leading email software firm, and CEO of Compendium, a blogging software company. A regular speaker on database and email marketing, he has presented at such venues as the Harvard Business School Entrepreneurship Conference, Ad: Tech, the American Advertising Federation, and the American Marketing Association, among others.